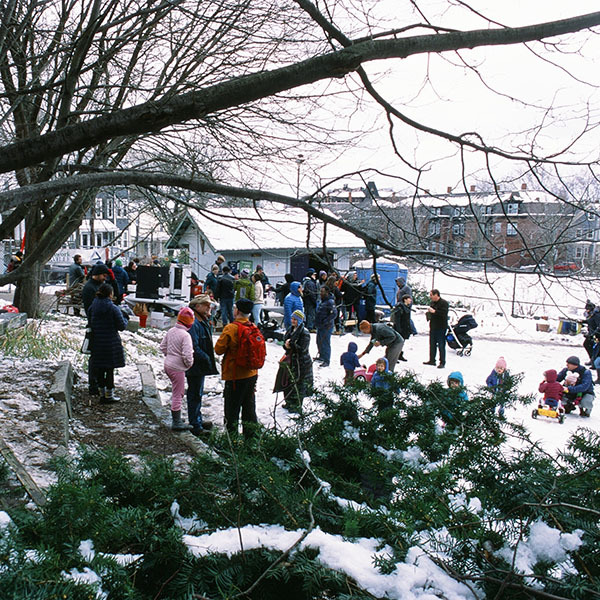 At many school garden organizations, the winter months tend to be slower and quieter. At Groundwork Somerville, however, we keep quite busy with the Maple Syrup Project! Now in its 18th year, the Maple Syrup Project has become a Somerville classic that people look forward to all year. In New England, the growing season is often thought of as the warm, snow-free time of year. This is mostly true, but ignores the maple syrup that is ready in the winter! 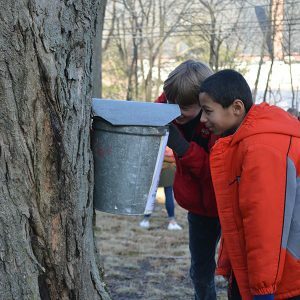 The goal of the Maple Syrup Project is to introduce as many Somerville students and community members to this delicious crop through education and taste buds. This year, 23 volunteers were trained to teach 24 classes of 2nd graders across seven Somerville Public Schools, about 415 students total. These volunteers went into classrooms once a week for four weeks to teach maple lessons with a focus on science, math, language arts, and social studies. After learning about the process of tree tapping, maple trees, and the seasons, each class came out to the Somerville Community Growing Center for a field trip. A wood-fired sap boiler allowed each student to taste warm sap collected from Somerville maple trees, a sensory experience that is one of my personal favorites. Soon after the field trips, 700 people came out to the 18th Annual Maple Syrup Community Boil Down, where many pancakes were eaten, live music set a cheery scene, and many maple crowns adorned the heads of children. Maple season was full of snow, sticky syrup, and so much learning, but as March turned into April, the sap stopped flowing and the leaves began to peek out, bringing us back to the gardens once more! This year 34 TerraCorps members are serving with nonprofit organizations across the state! Check out their stories, updates, and accomplishments by reading through our blog!